Geoff Brown calls it “vintage slow- burning gospel soul” So he writes in the current August issue of the always demanding to be read and kept Mojo magazine. 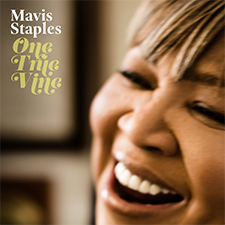 The focus is on another fantastic album release from Mavis Staples. For the 70 year-old plus singer this is no re-hash of better times, a reaching back to find a few gems. Take away knowledge of her age and just hear the voice, the musical treatment, the passion, and above all ‘how to do things’ and you walk sacred territory Her music is for anyone and everyone, and that’s why she’s in Mojo and other worthy magazines where music comes first, and where what is said has weight. One True Vine follows fairly close on the heels of the outstanding 2010 release ‘You Are Not Alone’. Both albums are produced by Jeff Tweedy. Previous to that go to 2007 for the Ry Cooder produced We’ll Never Turn Back. Ms Staples has followed the Johnny Cash route. Remember those last Cash albums, and where he got himself a young ‘with-it’ producer and a new man was born, and there followed a set of memorable albums. With someone such as Mavis you only have to hear the first few minutes of the new album to know greatness shines and life gets a big lift for you the listener. Staples kicked off her singing life, as so many American artists, in the family set-up. In her case it was The Staple Singers. The year was 1950 and while pop music was assuming some significance and teen singers were ready to warble, for Mavis it was learning to fit into the great tradition of Gospel, a scene celebrating itself Sunday by Sunday in the churches, a form that would of course influence much R&B, Soul, and say makes its mark on Elvis, later the Rolling Stones, just to make two name callings. With the freedom, compared to here with its Soviet style oppression on who broadcasts and who doesn’t, it was the US local radio station to add its outlet to a gospel family such as The Staples. They had a record contract with inspiring Vee-Jay and a hit in 1956 with the still so contemporary sounding, Uncloudy Day. Mavis graduated from school in 1957, Here were the Staple Singers led by Roebuck “Pops” on guitar and the voices of Mavis, Cleo, Yvonne and Pervis. In addition to the Vee-Jay label there would be releases on United and Riverside. The Staples would emerge on to the national music scene and find notice as they became much involved with the civil rights movement of the 1960s and especially with Dr Martin Luther King Jnr. Interestingly, and not without criticism, they ran their eyes over so-called secular songs, some of which were very much of their time. So explore their catalogue and you come up with Dylan’s much recorded A Hard Rain’s A-Gonna fall and the Stephen Still’ For What It’s Worth that was part of the song outpourings from the great band of the late 1960s, Buffalo Springfield. She does a version on her ‘Mavis live’ concert album. As Geoff Brown notes on the latest release she sings a cover of Funkadelic’s, Can You Get To That and less a surprise What Are They Doing in Heaven Today from another great name of gospel, Washington Phillips, and from Fred McDowell, Woke Up This Morning (With Jesus on my Mind). I have a London taxi driver friend Wally who tells me she was a fare of his a few years back and he had the pleasure of expressing to her his love of what she does. Crisis 11 mentioned the publishing of a Christian record chart in the UK. Quite where this is to be found is another matter. It doesn’t seem to be located in the pages of the British industry magazine Music Week. Actually the whole thing is hardly meaningful without that. A listing in MW might encourage dealers to stock. Basically in the UK Integrity issue most of the Christian based records. Few majors issue this kind of material. Sales of Christian material are low outside of the usual uplift thanks to the Greenbelt festival. Certainly in the US there are numerous Christian album and single releases but almost all of these do not find UK release –sadly. Anyone wishing to follow the US should read Billboard, assuming you can find a copy outside of London. However , Google ‘Official Christian & The Gospel Albums’ and there is a listing. The secular label contribution rests with Mavis Staples and her One True Vine (Anti) and two Parlophone label releases for Wow 30 and Where I Find You from Keri Job. Still, it’s good to see a listing and point of reference. Should you Google you will find various people adding comment with Tony Blanchi dominating. TJ took a look at HMV in London and found the main but limited stocking of Gospel is at the large store at the Tottenham Road end of London’s, Oxford Street. HMV stores in Plymouth and Truro had no section. Matt Redman could be found under ‘rock and pop’. Your thoughts are welcome. 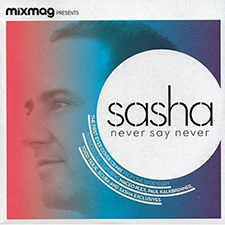 1 SASHA - Never Never – disc provided with Mixmag magazine. August 2013. 2 JAY- Z - Holy Grail. 3 MAVIS STAPLES – One True Vine. 4 CANTON SPIRITUALS – Live in Memphis. Not intending this to be a promo issue for Mojo, but in this August issue they remind us that it was five decades ago that a Liverpool outfit rode the then important charts with She Loves You. This was 1963. The British outfit were on the move to global status and acclaim, It was a year of relentless touring and dizzy sales. As a sideline it helped make the NME a 300.000 plus selling weekly under the editorship of Andy Gray. It had also great news coverage from Derek Johnson. So the Beatles charmed and excited millions. In 1963 in terms of albums and singles the Beatles had seven chart entries. That said, cold statistics do suggest another story and that is simply this: in British terms, Cliff Richard had the same number of singles and albums hitting the chart. But of course there is nothing fashionable for rock and contemporary music journals when it comes to the Indian born Cliff. Obviously the foursome would take the world whereas Cliff had only minor attraction in the USA. This first appeared in the British Methodist Recorder July 2013. Specific Jesus music releases are not exactly pouring forth at this moment, but there is one pretty sensational release in the mode of Hillsong and Abundant ministries – and that means for the most part high energy praise music. 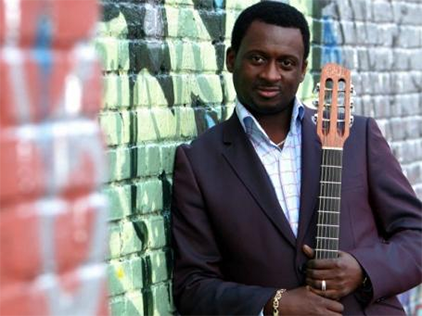 It centres around the first album in seven years from Noel Robinson Devoted came out in physical CD on July 5 and formerly in June as an exclusive ITunes download. Robinson is a pretty switched on singer, even if at times on this album he gets pushed back by a chanting and singing choir, for that just hear ‘Unity’ – on what a song!- a chorus that reels off why one should shout the name of Jesus., as it goes into .’One Saviour, one people, one Kingdom’ repeated and repeated until as they say it builds up a storm. ‘Thy Kingdom Come’ simply moves so richly and here Robinson gets his vocals knocked back as the choir-chorus pump it out, with a sudden entry from a mighty female voice that lifts it even higher. Eventually we roll out on quite party sing as “Let the kingdom come’ is repeated with Noel heard in the background saying ‘It is here’. ’Send your Spirit’ has a very soul-radio feel about it – a rich sound and the prayer that the ‘Spirit shall light the land, that justice shall come and mercy overflow.” Still, as in many a praise song we do not hear where justice shall be exercised, let alone what it might be. Still, an amazing album.